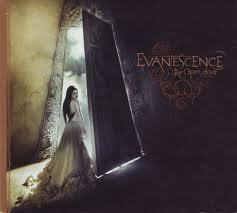 Amy Lee- the lead singer of Evanescence is the main focal image on the front of the digipak cover along with a very tall narrow door. She is used as part of the male gaze with the way she is stood in the doorway, back to the viewer and her head slightly turned round but looking down. The male gaze is brought to attention by her shoulders and how the elegant white and grey dress does not cover the right one and her long draping black hair is out of the way, neatly flowing down her back. The contrast in town of the light brown, on the left side of the door and the very dark blue on the white could show how she is walking through the narrow door into the light. The low angle photo shows the height of the door and the detail is very distinctive which is something I really like. The band name and title is really detailed with the pattern around which comes off the serif text nicely which is a nice effect. On the reverse side, the front imagery is portrayed further, with the open door taking up the right side of the back-cover and the dark sky illuminating with the detail of the door frame. 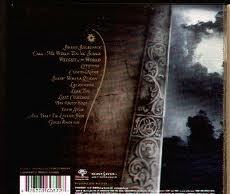 On the left simply is the titles of the songs included in the title, in the same font as the text on the cove, following the line of the door frame with simple decoration of a stem & thorns. Inside is very plain. A very light brown (similar as that on the cover) with faint littler flowers as decoration. This digipak is a four parter, and on the left side, is a little booklet which is attached containing all the lyrics and also images of the band, decoration and singularly the lead singer.